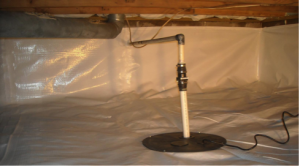 Save your Home by removing water from your Crawl Space! Does your home have a wet crawl space? Do you see standing water puddles in the crawlspace after it rains? Is the foundation block walls wet at times? Is the dirt floor muddy? If so, then you are in need of a crawl space drainage system. There are several ways water gets in a crawl space. Groundwater seeps, leaks and even rushes into many crawl spaces. It enters under the footing, between the footer and foundation wall, through the porous, block walls, and through cracks in poured walls. After it seeps in, it floods, puddles, and slowly evaporates moisture upward into the home. A sump pit and pump alone cannot sufficiently eliminate water from its source. Water must be intercepted before it surfaces onto the dirt floor of the crawl space. A wet environment is very unhealthy and destructive. Mold thrives in wet crawls and reproduces by producing airborne spores by the millions, and some molds are toxic. Rot and decay occur in wet environments causing structural damage to the home. Our Crawl Drain System is an interior perimeter water management system. It is designed to intercept water before it infiltrates into the crawl space area. The Crawl Drain installation consists of hand trenching the interior perimeter followed by the installation of aggregate and drain tile. The drain tile is a 4” perforated, corrugated flex tile that is backfilled with filtration aggregate which prevents unwanted sediment in the drains and ensures Life time operation. Our Crawl Drain System is backed by a LIFETIME WARRANTY against standing water in your crawlspace. External drainage systems are recommended in some cases where applicable. A 6 mil vapor barrier is always installed over a drained crawl space, but we highly recommend encapsulating your crawl space with Crawl Seal Encapsulation system for maximum moisture and water vapor reduction. Contact us today for your free, no obligation crawl space drainage quote! 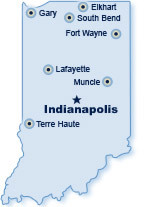 We serve the Greater Indianapolis Area and many surrounding areas, including Avon, Carmel, Fishers, Noblesville, Bloomington, Columbus, Greenfield, Plainfield, Muncie, Mooresville, Martinsville, Greenwood, Franklin, Columbus, Terre Haute and nearby. 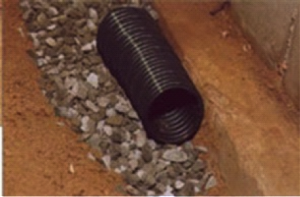 Why should you install a drainage system in your crawl space? Why is a wet crawlspace so bad? Well, if your crawl space isn’t well drained and kept dry, you are at risk for many problems. A wet crawl space is a very welcoming environment for termites that will destroy your structural components costing thousands in repairs. The most important reason to remove water from your crawlspace is to prevent mold growth. Wet crawlspaces are highly conducive environments to mold, which can be detrimental to health of those in your household as well as your home’s value. Helps eliminate problems like termite infestations, wood rot, mold growth, and high humidity levels. Increases the value of your home – most buyers will not buy a home with a wet crawlspace.